You’re thinking about buying a new home and wondering if you should go big or small. Perhaps your budget prevents you from going too big. But just how much home is enough? The median size of a completed single-family house in 2014 was 2,453 square feet according to the U.S. Census Bureau. 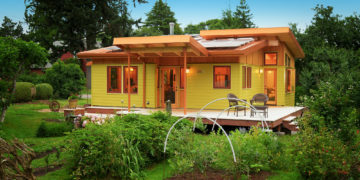 By contrast, you may have heard about so-called tiny houses, defined as 400 square feet or less — for those very serious about living a simple, frugal life. You don’t have to go tiny, but a smaller than average home might fit the bill. Sarah Susanka, architect and well-known author of the Not So Big House book series, describes a “Not So Big House” as one not as big as most people are building, focused on quality rather than quantity. Her book series came about as she was working as a residential architect. She wanted to help clients use their money more effectively, tailoring their home not only to their budget but their lifestyle. She says homes should scale to the way occupants actually live and what appeals to them aesthetically and sustainably — not just in terms of materials or how much energy it uses, but also in desirableness to maintain. It’s been 10 years since Hurricane Katrina devastated the Gulf Coast. Marianne Cusato, designer of the so-called Katrina Cottages, admits to being inspired by Susanka’s Not So Big House concept. Congress appropriated $400 million for an alternative emergency housing program based on Cusato’s award-winning, 308 square foot Katrina Cottage design (designs range up to 1,807 square feet). These small, sturdy homes could be delivered at the cost of a FEMA trailer, and many were used in Louisiana and Mississippi after the 2005 hurricane. Some models have options allowing expansion over time, so many of these cottages are still in use today. Saying it’s hard enough to afford a house under the best circumstances, Cusato’s not surprised Katrina Cottages have been sought by those not in need of emergency or disaster housing. In her book, The Just Right Home, she addresses figuring out how you want to live, not just where. They discovered Susanka’s books and in the appendix Michael Klement’s architectural firm listed in Ann Arbor, Mich., close to where they eventually built their home. The couple bought a 10-acre parcel adjoining Linda’s sister’s family, oriented for the passive solar heating they wanted. Klement’s firm designed a 1,600 square foot, highly energy-efficient home on the land. But there were tradeoffs. One was not having a designated living room. It suits, Mahan says, because he and Linda mostly eat dinner while watching TV. And he built a long hunting table with drop leaves to accommodate six people for when they have dinner guests. Julie Hulme and her husband, Rob Handy, went even smaller. They lived in a 625 square foot renovated chicken coop along the Willamette River in Oregon before they “upsized” to a new 825 square foot home. She says she wanted a home design that let the inside and outside spaces intersect while maintaining a sense of coziness and intimacy. Both Hulme’s and the Mahans’ homes have energy-efficient features that would likely cost more in a larger home — more materials, more space to heat and cool, etc.—so building small made “green” more affordable. So beware — a small, feature-loaded home may cost as much or more than a less-appointed larger home. Because professionals who understand and embrace the Not So Big House concept aren’t easy to find, Susanka has a Home Professionals Directory on her Not So Big House website listing architects, builders and interior designers from around the country who do this kind of work. And she offers house plans for sale — her own and links to others she recommends. Though important when building any custom home, carefully selecting your architect and spending time to make sure they understand how you want to live in your new home is particularly important when building a small home.